On Wednesday May 13, 2009 from1:30 to 3:00 I’m scheduled to drop by the session at Sage’s Insights on Social Media. I am not presenting but Sage thought it would be nice to have a partner there to talk with other partners about their successes with Social Media. To my competition …. I say it’s all a huge enormous waste of time. I warn them repeatedly not to waste their precious time with LinkedIn or Facebook. Instead, keep writing fat checks for direct marketing or telemarketing. Activities that bring in under a 1% response. Ignore the fact that while costs of direct marketing skyrocket every year – the effectiveness shrinks twice as fast. Paying Google $300 per month for Adwords is a better bet than Social Media. I know the amount because 5 years ago I ran a Google campaign for 3 months. It cost me over $300 per month. I didn’t sell a single deal. Gathered not a single lead. But everyone else is doing it – so I recommend to my competitors that they keep doing it too – and maybe bid up their per keyword amounts as well. Special shout out to the competitor who bought the Google Adword “Schulz Consulting”. You pay every time someone clicks it. My family and friends chuckle every day. Weekends too. SEO is a better investment than Social Media. Keep writing blank checks for search engine optimization. 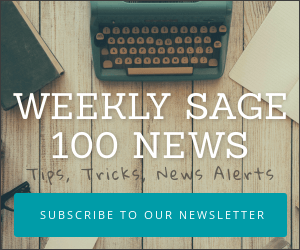 PS – Did you know you can send out your own link filled press releases (for free)? Yes, they show up in Google News. I hope that you’re not writing a fat check just to get that SEO snake oil salesman to write a press release that you could do yourself? Keep at this. Everyone’s doing it so it must work. At the very least you should get the same results – basically nothing. Going to see cold call appointments is a better investment than Social Media. If you are one of 5 SALESpeople waiting in the lobby to see a cold prospect – you have a 1 in 5 shot. Except for when one of those people is the preferred supplier (good luck figuring out which one). Don’t you love the attitude from cold call prospects? The “you called me – so show me what you have with lots of free demonstrations, analysis and research”. Pretty much every VAR must love this treatment because they keep doing it — year after year after year — even as the results get poorer and poorer and poorer. Those prospects who don’t answer the phone are “just busy”. Repeatedly calling them is a better idea than Social Media. Keep calling because sooner or later the law of big numbers will produce a prospect that picks up the phone. And anyway, those outbound calls look good on a sales activity report too. Keep doing what you’ve always done because the market will come back and Social Media is a big fad. Don’t change your selling tactics – just double your effort (and probably quadruple your selling cost). Sooner or later the market will “turn around” and you’ll be ready! This is what all the VARS are doing. Remember! Safety in big numbers. Plus – it’s fun commiserating with every other VAR. What fun would it be if you were the exception who is making money and gaining new clients? If you think this thinking is wrong – you’re not the only one. I haven’t done any of the above in over 10 years. In the last 10 years my biggest competitor in the state sold his practice. A dear friend in NY who told me how crazy I was to practice Social Media sold her practice. Neither of these competitors “got” Social Media. Chances are that you don’t either. Are you willing to learn? A little curious? I get all my business from what I consider Social Media. Every last dime. 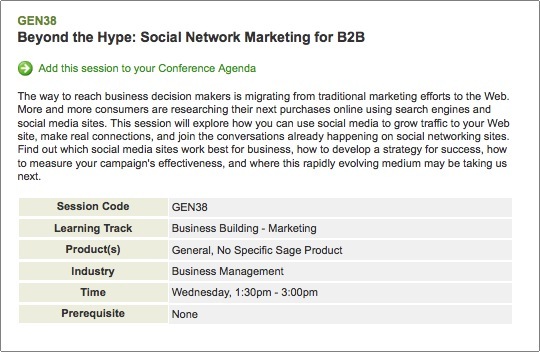 Drop by session GEN 38 Beyond the Hype: Social Network Marketing for B2B Wednesday May 13 from 1:30 to 3:00pm (unless you’re a competitor – then please please keep doing what you’re doing). I’ll share my definition of Social Media. How I do it. How much I make from it. Why your nuts not to do it. To my competition – keep doing what your doing. Stay home from Insights because it’s a waste of time. To the rest – see you at GEN38.